Home » Frequently Asked Questions » How is my Workers’ Comp. Benefit Calculated? How is my Workers’ Comp. Benefit Calculated? How is my Weekly Wage Benefit Check Calculated? 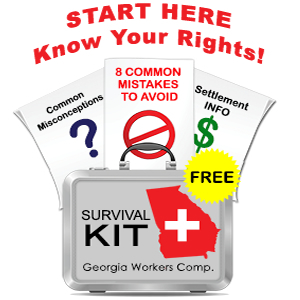 Under Georgia’s workers’ compensation law, an injured worker who is kept out of work by his doctor will be paid 66 2/3% of his average weekly wage during the time he or she is out of work. This is called your temporary total disability benefit (your “TTD” benefit). Currently, per Georgia’s workers compensation commission, the maximum benefit payable is $575 per week. If your accident occurred prior to 2017, the cap on your average weekly wage for lost wages will be slightly lower. Per the Georgia workers compensation board, the average weekly wage is calculated by looking at the 13 weeks prior to the date of your work related injury. In situations where an employee has not been on the job for 13 weeks, the injured employee is supposed to be paid based on the compensation rate of a similar employee with a similar job. There are a number of other rules that apply in unusual situations – such as when the 13 week look back includes periods of short term disability payment. The amount of your “comp rate” will have a bearing on how much you can expect at settlement. Part of the settlement calculation involves looking at the insurance company’s financial exposure. If your comp rate is $575 per week and the insurance company could be on the hook for another 200 weeks, their exposure is over $100,000. If your comp rate is $200 per week, their exposure would be $40,000 at the most. Thus, the “value” of your workplace injury case will be lower if you have a lower comp rate. When I am representing an injured worker, I always look at the average weekly wage calculation and confirm that it is accurate and that you are receiving the maximum TTD payment that applies in your job injury case.